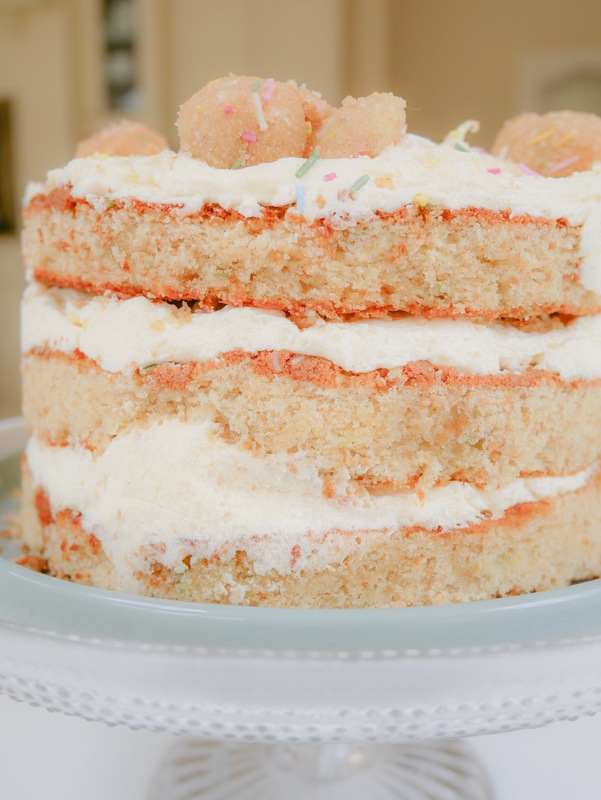 Ever since watching Christina Tosi‘s episode of The Chef’s Table on Netflix, I have been CAPTIVATED by her Birthday Cake recipe. I loved the look, so I decided (seeing as “it’s my party and I’ll bake cake if I want to” those are the lyrics right..?!) 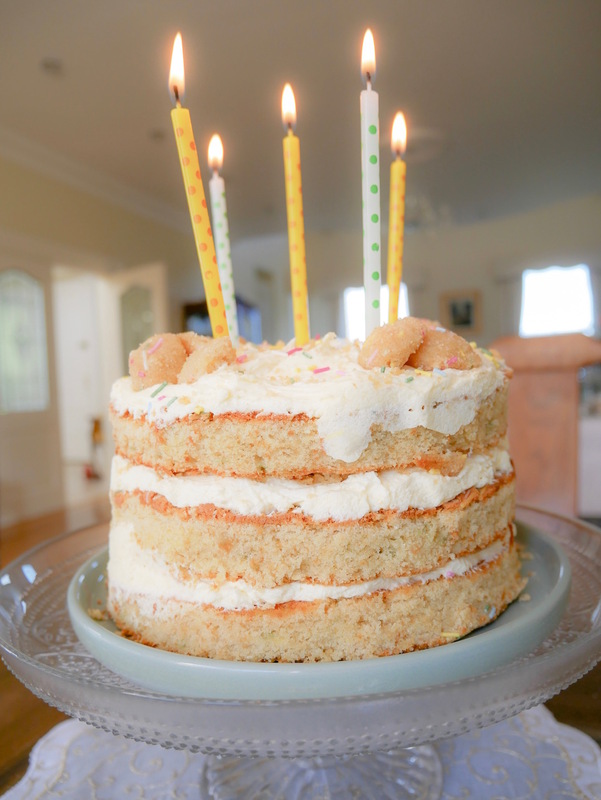 that I was going to make the cake for my own birthday this year – and I did!! I am BEYOND thrilled with how it turned out, but before I get into that – backstory!! Christina Tosi shot to fame with her eatery Momofuku Milk Bar, after Anderson Cooper waxed lyrical about some of Milk Bar’s offerings (crack pie being the main topic!). Since then she’s been at the forefront of celebrity bakers on tellyboxes across America and then some. Watching Christina discuss cake during one particular monologue, had me – as an Actress – positively itching to learn it off for whenever the need may arise! 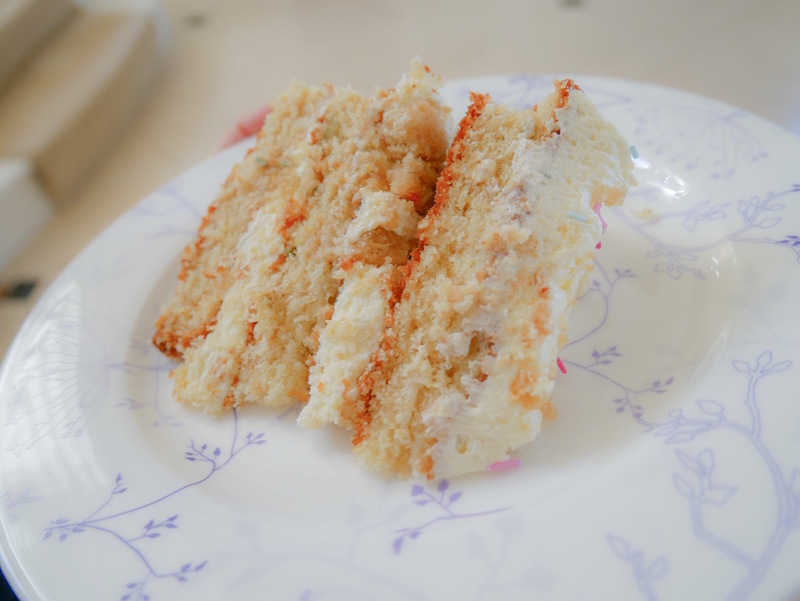 The “crumb” is basically crunchie cookies, you can see them on the top here ^ but they are also inside the cake as well – yum! They were delicious and light-hearted wars were had over the ones remaining after everyone had had a slice! I’m not going to go into each recipe here, because Christina does a far better job than I could giving step-by-step instructions on her website. 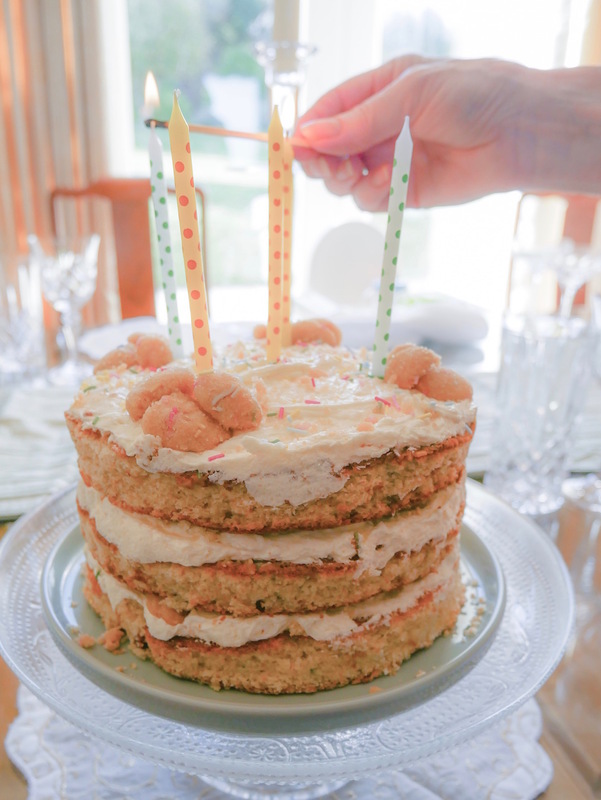 By following it with great patience, I just know you’ll be able to make this epic birthday cake too! 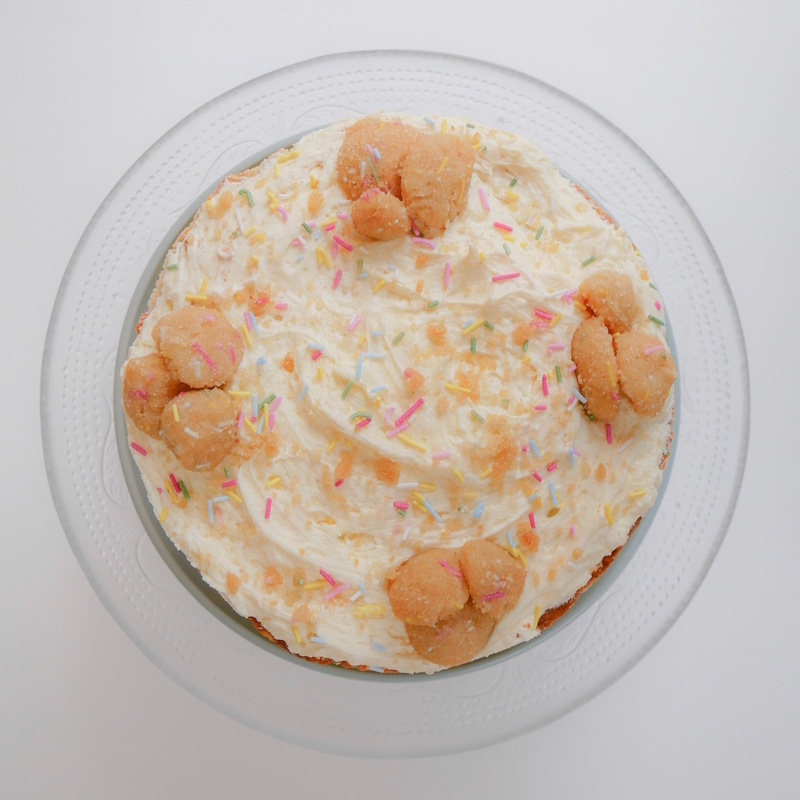 Whilst I won’t be walking you through how to make it, I will however, give you a few tips from my experience in making this for the first time in the hopes that it will aide you in your first bake! I used Dr. Oetker Sugar Strands and whilst they looked great on top of the cake, they were actually meant to be visible within each layer of the sponge too but during the baking process, the majority of them disintegrated, so when I make this again, I’ll be looking for sprinkles that are a little more hardwearing – let me know if you have any suggestions! I didn’t have a 6″ cake ring, nor did I have acetate paper. This would no doubt make assembling the cake FAR easier and I will be keeping an eye out for both moving forward, but what I did, was assemble the cake freehand, then ran some grease proof paper around the outside and then wrapped a strip of wide ribbon around the outside, tied it together and placed it in the fridge overnight. This resulted in a lovely, strongly formed cake and even after hours of being out of the fridge before being consumed on Sunday, it still looked structurally as good as when I first took it out of the fridge, so I’m taking it as a win! There you have it – a few adaptations – but ones I feel Christina would forgive me for as she does seem to be an advocate for home baking and trying out new things. The time and effort this cake took I would endure again in a heartbeat and I’m also pretty sure the time will decrease as I get more confident with making it too! I’m delighted with how it turned out both visually and edibly! Not a morsel was left and it was wonderful to see my family enjoy – so thoroughly – something which I had made with my own two paws, from our littlest family member to our eldest! What do you think, would you give this cake a try? Happy belated birthday! 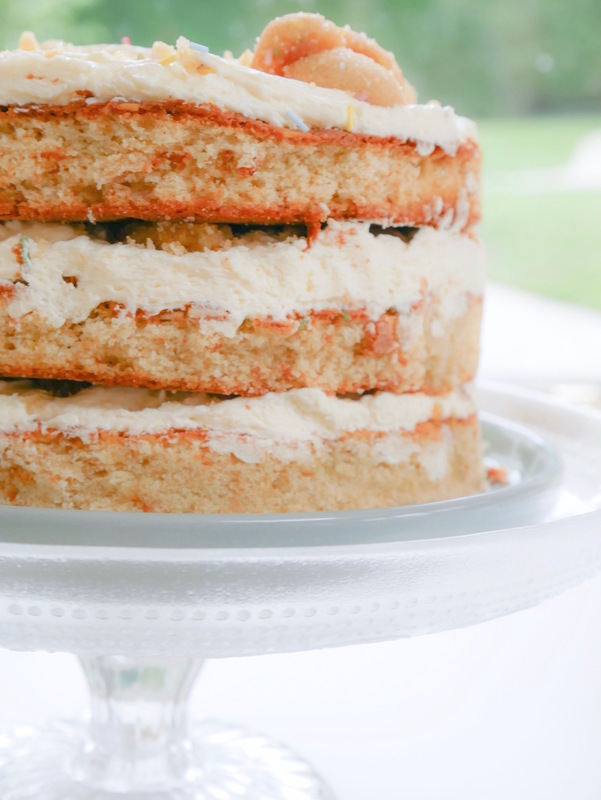 Oooh this cake looks divine! It screams birthday cake. 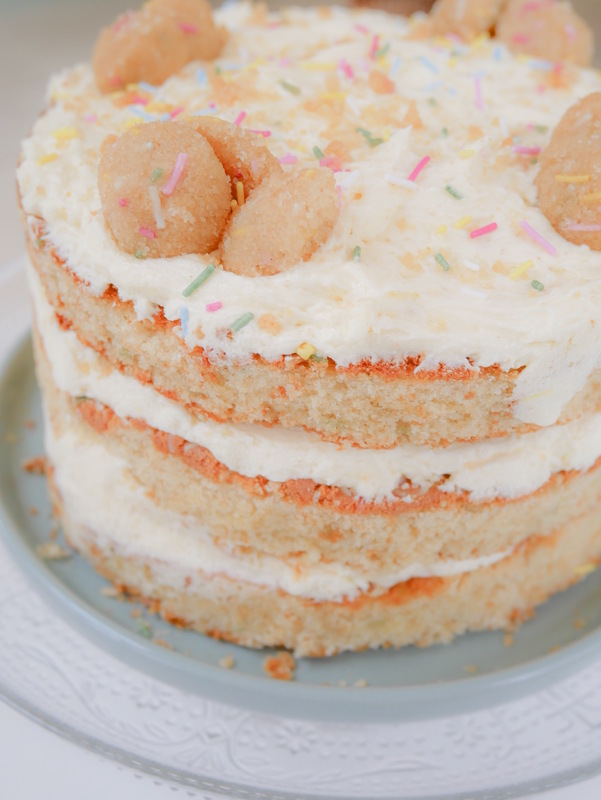 I would definitely give this cake a try but I don’t know how well it would turn out seeing as my baking skills are not the greatest….LOL. Thank you so much! As for your baking skills, you never know until you try Des – I’m sure you’d do a super job! Looks yummy! I Hope you had a Blessed and Happy Birthday! I did, thank you so much Liz!! Thanks Mary – I’m delighted with how it turned out!! This bday cake looks SOOOO DELICIOUS!!! Huge conrats my lovely hope you had the most amazing of birthdays, best wishes for the new year!! Thank you so much lovely and I totally agree, she is SO inspiring! !